This December 2014 report from Global Financial Integrity, “Illicit Financial Flows from the Developing World: 2003-2012,” finds that developing and emerging economies lost US$6.6 trillion in illicit financial flows from 2003 through 2012, with illicit outflows increasing at an staggering average rate of 9.4 percent per year—roughly twice as fast as global GDP. This study is GFI’s 2014 annual global update on illicit financial flows from developing economies, and it is the fifth annual update of GFI’s groundbreaking 2008 report, “Illicit Financial Flows from Developing Countries 2002-2006.” This is the first report to include estimates of illicit financial flows from developing countries in 2012—which the study pegs at US$991.2 billion. US$991.2 billion flowed illicitly out of developing and emerging economies in 2012, the latest year for which data is available. The illegal capital outflows stem from crime, corruption, tax evasion, and other illicit activity. The report finds that from 2003 to 2012, developing countries lost US$6.6 trillion to illicit outflows. The outflows increased at an average inflation-adjusted rate of 9.4% per year over the decade—significantly outpacing GDP growth. As a percentage of GDP, Sub-Saharan Africa suffered the biggest loss of illicit capital. Illicit outflows from the region averaged 5.5% of GDP annually. 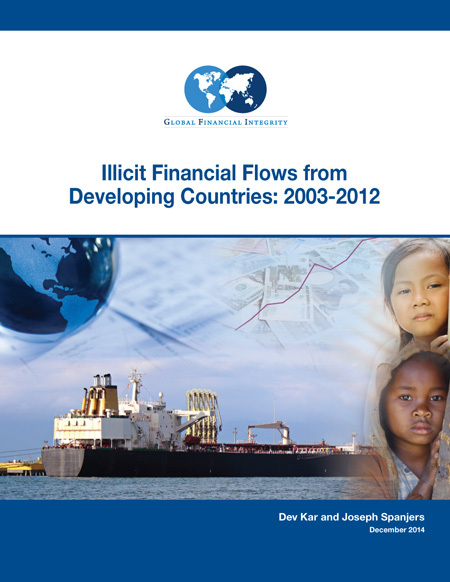 Globally, illicit financial outflows averaged 3.9% of GDP. The fraudulent misinvoicing of trade transactions was revealed to be the largest component of illicit financial flows from developing countries, accounting for 77.8 percent of all illicit flows—highlighting that any effort to significantly curtail illicit financial flows must address trade misinvoicing. China leads the world over the 10-year period with US$1.25 trillion in illicit outflows, followed by Russia, Mexico, India, and Malaysia. China also had the largest illicit outflows of any country in 2012, amounting to a massive of US$249.57 billion in just that one year. The below table ranks all countries by the highest average annual illicit financial flows over the decade (when data is available). The below table ranks all countries by the highest illicit financial flows in the year 2012, the latest year for which data is available. (.) indicates no available data, whereas (0) indicates a value of 0. Illicit financial flows from developing countries are facilitated and perpetuated primarily by opacity in the global financial system. This endemic issue is reflected in many well-known ways, such as the existence of tax havens and secrecy jurisdictions, anonymous companies and other legal entities, and innumerable techniques available to launder dirty money—for instance, through misinvoicing trade transactions (often called trade-based money laundering when used to move the proceeds of criminal activity). While policy environments vary from country to country, there are certain best practices that all countries should adopt and promote at international forums and institutions such as the G20, the G8, the United Nations, the World Bank, the IMF, and the OECD. Regulators and law enforcement officials should strongly enforce all of the anti-money laundering laws and regulations that are already on the books, including through criminal charges and penalties for individuals employed by financial institutions who are culpable for allowing money laundering to occur. All countries and international institutions should address the problems posed by anonymous companies and other legal entities by requiring or supporting meaningful confirmation of beneficial ownership in all banking and securities accounts. Additionally, information on the true, human owner of all corporations and other legal entities should be disclosed upon formation, updated on a regular basis, and made freely available to the public in central registries. The United Kingdom2 and Denmark3 have made progress on this front recently, with both countries announcing that they would create such public registries of beneficial ownership information–at least for corporations. Other countries should follow their lead. In March, the European Parliament voted overwhelmingly in favor of directing European Union member states to create public registries of beneficial ownership as part of revisions to the European Union’s Anti-Money Laundering Directive (AMLD),4 but final adoption of the AMLD is still subject to negotiation and approval by the European Council and Commission, which have both been reticent to approve the transparency measure.5 GFI urges the EU Council and the EU Commission to quickly approve the public registry requirement as part of the AMLD. All countries should actively participate in the global movement toward the automatic exchange of financial information as endorsed by the G20 and the OECD. 89 countries have committed to implementing the OECD/G20 standard on automatic information exchange by the end of 2018, significant progress since the publication of the 2013 IFF Update. Still, the G20 and the OECD need to do a better job at ensuring that developing countries—especially least developed countries—are able to participate in the process and are provided the necessary technical assistance to benefit from it. All countries should require multinational corporations to publicly disclose their revenues, profits, losses, sales, taxes paid, subsidiaries, and staff levels on a country-by-country basis, as a means of detecting and deterring abusive tax avoidance practices. Trade misinvoicing accounts for a substantial majority—77.8 percent—of illicit financial flows over the period of this study, meaning that curbing trade misinvoicing must be a major focus for policymakers around the world. Governments should significantly boost customs enforcement by equipping and training officers to better detect the intentional misinvoicing of trade transactions. Trade transactions involving tax haven jurisdictions should be treated with the highest level of scrutiny by customs, tax, and law enforcement officials, given the greater potential for abuse. Such a narrowly defined goal—focused on trade misinvoicing, the most common method for moving money illicitly, as this report shows—will target more than three quarters of global illicit financial outflows from developing economies. Similar language should be included in the outcome document of the Financing for Development Conference in July 2015. Financial Action Task Force. The FATF Recommendations: International Standards on Combating Money Laundering and the Financing of Terrorism & Proliferation. Paris, France: FATF, Feb. 2012. http://www.fatf-gafi.org/topics/fatfrecommendations/documents/fatf-recommendations.html. Government of the United Kingdom. Tough Action Promised on Hidden Company Owners. London, England: The Government of the United Kingdom, April 21, 2014. https://www.gov.uk/government/news/tough-action-promised-on-hidden-company-owners. Christensen, Johan and Anne Skjerning. “Regeringen vil åbne det nye ejerregister for alle.” Dagbladet Børsen (Copenhagen, Denmark), November 7, 2014. http://borsen.dk/nyheder/avisen/artikel/11/97562/artikel.html. European Parliament. Parliament Toughens Up Anti-Money Laundering Rules. Brussels, Belgium: The European Parliament, March 11, 2014. http://www.europarl.europa.eu/news/en/news-room/content/20140307ipr38110/html/Parliament-toughens-up-anti-money-laundering-rules. Global Financial Integrity (GFI). GFI Praises Denmark Commitment to Crack Down on Anonymous Companies with Public Registry. Washington, DC: GFI, Nov. 7, 2014. http://www.gfintegrity.org/press-release/gfi-praises-denmark-commitment-crack-anonymous-companies-public-registry/. Open Working Group on Sustainable Development Goals. “Goal 16.4.” Open Working Group proposal for Sustainable Development Goals. New York: United Nations, July 19, 2014. http://sustainabledevelopment.un.org/sdgsproposal.html. In addition to downloading the full PDF of the study, the full report can be read, shared, and embedded via the Scribd window below. Dev Kar is the Chief Economist at Global Financial Integrity. Prior to joining GFI, Dr. Kar was a Senior Economist at the International Monetary Fund (IMF). During a career spanning nearly 32 years at the IMF, he worked on a wide variety of macroeconomic and statistical issues, both at IMF headquarters in Washington and on different types of IMF missions to member countries (technical assistance, Article IV Consultations with member countries, and Use of IMF Resources). He has published a number of articles on macroeconomic and statistical issues both inside and outside the IMF. Dr. Kar has a Ph.D. in Economics (Major: Monetary Economics) and an M. Phil (Economics) (Major: International Economics) from the George Washington University as well as an M.S. (Computer Science) from Howard University (Major: Database Management Systems). His undergraduate degree in Physics is from St. Xavier’s College, University of Calcutta, India. Joseph Spanjers is a Junior Economist at Global Financial Integrity. Prior to joining GFI, Joseph conducted international trade research in Minneapolis and supervised a State Department scholarship program in Morocco. Joseph received a BS in Economics and a BA in Global Studies from the University of Minnesota. The authors wish to thank and acknowledge Michiel Bogaert (Intern), Shunquin Chen (Intern), Christine Clough (Program Manager), Clark Gascoigne (Communications Director), Maximilian Kremer (Intern), Channing May (Policy Research Assistant), and Joshua Simmons (Policy Counsel) for their contributions to the production of this report. GFI and the authors would also like to acknowledge Gil Leigh of Modern Media for his contributions to the layout and design of the publication.